Lionel Messi was the star of the show and Philippe Coutinho scored a screamer as Barcelona swept past Manchester United 3-0 (4-0 on aggregate) to reach the Champions League semi-finals. Marcus Rashford hit the bar for Manchester United after 37 seconds but Barcelona weathered an early onslaught to take control of the tie. 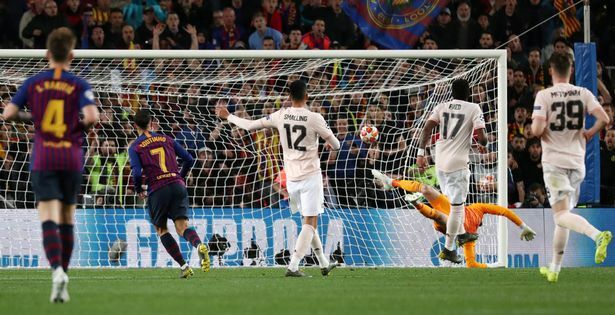 Messi capitalised on a mistake by Ashley Young to curl home the opening goal from outside the box, adding a second with the help of a David de Gea howler. Coutinho whipped in a brilliant third as Barcelona cruised into the next round, where they will face Liverpool or Porto. Lionel Messi, strangely, hadn’t managed a goal in his previous 12 Champions League quarter-final matches, dating back to April 2013 when he scored against PSG. For the best player in the history of football, that was an unwanted record. After Chris Smalling gave him a bloody nose in the first leg at Old Trafford, putting him off his stride, Messi wanted to make a point at the Nou Camp. The Argentine genius struck two goals in less than five first half minutes, curling one past De Gea and sending another strike under the Spanish stopper, to firmly pull the tie in Barcelona’s favour. Nutmegs on Fred and later Phil Jones gave the feeling that he was playing with the visitors like a cat with his prey. Barcelona must be considered favourites to go on and win the competition with Messi in his perfect pomp. David de Gea is widely considered one of the best goalkeepers in the world but his reputation within Spain is surprisingly low. After a dismal World Cup with La Roja, some called for De Gea to be replaced in goal for the national team. Coach Luis Enrique has not obliged, but De Gea will be taken down another peg or two after his weak attempt at saving Messi’s low right foot effort saw the ball squirm under him for Barcelona’s second. “It was too naive an error not just for David de Gea, but for any goalkeeper in the Champions League quarter-finals,” complained Spanish newspaper ABC. Perhaps De Gea feels pressure to impress which he doesn’t in England, but this was another bad night for him under the Spanish spotlight. Ole Gunnar Solksjaer urged his forwards to be more clinical before the game. “That’s the 100 million dollar question, who can score goals?” said the coach. Marcus Rashford missed in the first minute when through on goal and Messi gave the England forward a lesson in finishing after that. But the hard work begins here for United. Not many from this side can seriously be considered good enough to win titles or European Cups. The defence was taken apart by Barcelona and needs a drastic overhaul, with Phil Jones, Chris Smalling and Co not elite players. Solksjaer’s honeymoon is over and big changes are necessary at Old Trafford this summer. Despite their dominance in La Liga, Barcelona have hit a brick wall in the Champions League quarter-finals three seasons running. Defeats by Atletico Madrid, Juventus and Roma last season have stopped the Catalans from reaching the final four, a source of immense frustration at the club. However they eased to victory against United and are in the final four for the first time since they won it four years ago. With a likely semi-final against Liverpool to come, Barcelona have the scent of the trophy in their nostrils, and they are beginning to think it smells a lot like the trebles they won in 2009 and 2015. Having reached the Copa del Rey final and holding a nine point advantage in La Liga, Barca are dreaming of an historic treble treble. Barcelona fans have been reasonably patient with Philippe Coutinho but the Brazilian’s poor performances have sometimes seen him whistled by supporters at Camp Nou. A promising debut season following his move from Liverpool has given way to a disappointing second year, in which he has constantly been linked with the exit. However after curling in a trademark effort from distance for Barca’s third goal, Coutinho had a message for his critics, be they fans or journalists. Coutinho put his fingers in his years, telling anyone who has spoken against him that he’s not listening. Will this goal be a turning point for him at Barcelona? The board, who made him a club record signing for 165 million euros, will certainly hope so. Some sectors of the fans might not be so impressed by his petulant reaction, though, given criticism of his displays has largely been deserved.